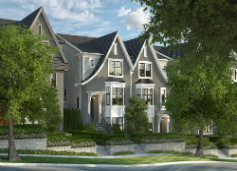 Roxton is a group of gorgeous duplex homes located on Roxton Avenue on Burke Mountain. Located minutes from amenities, these duplexes are nestled among parks and trails. These three bedroom, three level homes boast 10’ ceilings and plenty of living space. Roxton was brought to you by Mosciac Homes, a premier builder in British Columbia, who have worked on several developments on Burke Mountain and in the Tricities.